No other wine region I can think of has come so far so fast. Just 15 years ago, Ningxia had less than 3,000 hectares under vine and now they have over 40,000. The region was unheard of among wine professionals in the 1980s and even in the 1990s, most people could not even locate the province on a map. When Chinese wine giants like Changyu and Great Wall embarked on their ambitious expansion program in the late 1990s they identified Ningxia, Gansu and Xinjiang as regions that could produce more robust, ripe red wines compared with the monsoon-plagued eastern coast. Thus farmers in the western regions converted to grapes as a crop that was in demand and could be grown fairly easily. With government funding and support, the province began to move towards building themselves in the likeness of a new wine region somewhere between Napa Valley and Bordeaux. The fast and furious speed gained momentum with foreign investment from companies like LVMH and Pernod Ricard. But the turning point came in 2011 when Ningxia’s very own winery Helan Qingxue’s Jia Bei Lan Cabernet blend won the International Trophy, the highest accolade, in the Decanter World Wine Awards. Wineries have grown to around 100 with just as many being projected to come into fruition in the coming five years. Despite the rosy picture, Ningxia is not without its challenges, and the foremost challenge is the weather. Given the desert-like hot conditions over the summer and freezing cold winters, farmers have much to be worried about. But these challenges have been well countered by burying the vines over the winter months manually then unearthing them in the spring, and enjoying the readily available water from the Helan mountains for irrigation. It is not uncommon to find red wines here with over 14% alcohol whereas in Yantai in Shandong province on the eastern coast, grapes struggle to reach 13% alcohol. 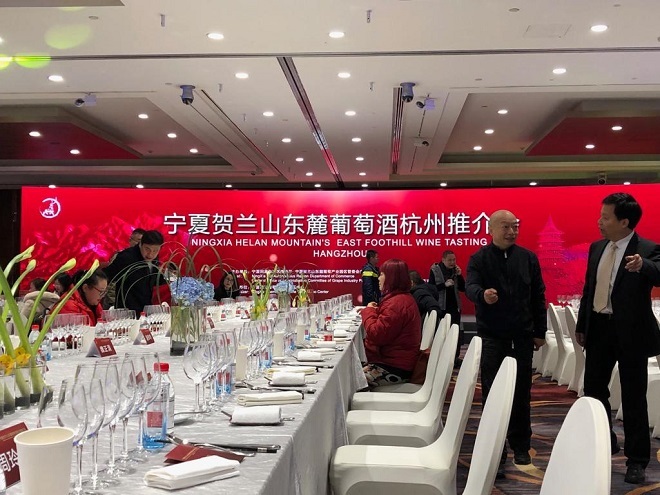 A week traveling with the Ningxia winery association in China in February 2019, allowed me the opportunity to taste over 35 wines from the region. I was impressed with the quality and diversity of the wines. Twenty years ago, many of the wines would have been faulty; ten years ago the wines were decent but unimpressive; now some of these wines are ready to compete in the international market. While the region is known for its red wines, mostly from Cabernet Sauvignon, there is now more experimentation with grapes like Syrah and Cabernet Franc. White wines from Chardonnay and Riesling are improving and the sheer diversity being explored is a breath of fresh air. Ningxia has succeeded in putting themselves on the fine wine map faster than any region I can think of and the same drive is now being used to refine, improve, diversify and achieve heights that Chinese wineries would not have dreamed of just a decade ago. I am looking forward to seeing more wines from China and from Ningxia on wine lists around the world. If you don’t see them now, it is only a matter of time. See my tasting notes and review of the top ten wines from Ningxia here.